Donglin (East Wood) located at the south of Sihe village , is a Buddhist monastery approximately 20km away from Jiujiang, Jiangxi, China. It was built in the Ming dynasty (386) , at the foot of Lushan by Hui Yuan, founder of the Pure Land Sect of Buddhism. 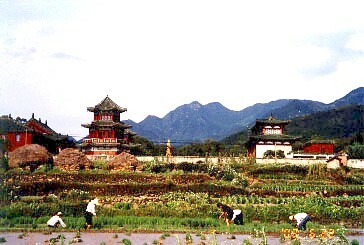 The monastery rebuilt for many times and reached its peak period in Yuan and Ming periods. Since an emperor Qianwang of Zhou Period was buried in the monastery after his death, the monastery became his family temple. Now, all the ancient buildings have been gone, instead of more than 15 halls built in recent years. The remainers include 1 ancient tower, 8 pieces of tablets and 1 iron tripod.